Biggest Alligators in the West! Colorado Gators is a friendly, family oriented, working farm that grows Rocky Mountain White Tilapia. The farm was started in 1977 by the Young Family. 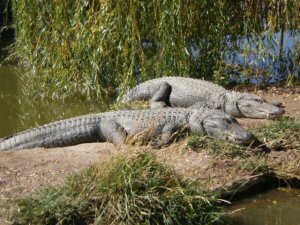 In 1987 the family purchased 100 one year old alligators to help with fish waste removal. 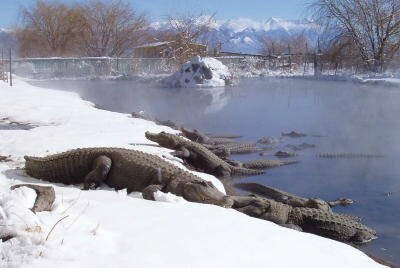 These alligators grew quickly in the warm geothermal water and the public wanted to see them. So in 1990 the farm was opened to the public. Over the years it has grown into an animal rescue site taking in unwanted “pets” that people can no longer care for due to their size or situation. 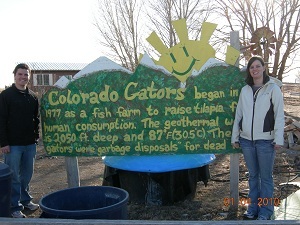 Click here if you have visited Colorado Gators; we would love to hear your story! The following video is from the Colorado Gator Farm and shows a great overview of the farm. It is a little lengthy but very informative. 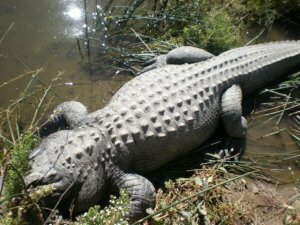 Colorado Gators is located 17 miles north of Alamosa, Colorado on Highway 17. If you don’t know exactly where you are going, don’t worry. 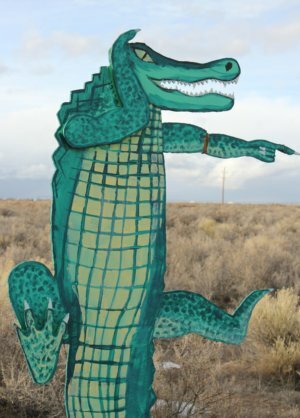 As you drive north on Highway 17 you will see tall alligator signs pointing you in the correct direction. The hours during the summer (Memorial Day through Labor Day) are 9 a.m. to 7 p.m. and during the winter (Labor Day to Memorial Day) are 9 a.m. to 5 p.m. each day. They are open seven days a week with the exception of Thanksgiving and Christmas Day. The admission is $15.00 for adults, $7.50 for children (6 to 15) and senior (65 to 80), 5 and under and 80 and over are free. Discount tickets are available at area merchants, such as the Alamosa Chamber of Commerce, or you can print a coupon from their website at http://www.gatorfarm.com. Special occasions usually have free admission so check the Colorado Gators website before visiting. Weather in Colorado can change rather quickly so it is important to always be prepared. You will be walking inside and outside, so layers are important. Don’t be deterred by the weather as the alligators are outside year round. The warm geothermal water allows for this and it is not uncommon to see the alligators sunning themselves while laying in the snow. Upon arriving at Colorado Gators you might notice a unique, unpleasant smell. This is the smell of a working fish farm. Enter through the admission building to pay the entrance fee and shop for any souvenirs. The entrance building is also the exit building should you wish to buy your souvenirs at the end. I would recommend buying the tub of alligator feed. This will often entice many “sleeping” gators to get into the water and swim towards the food. As this is a working farm and not strictly a tourist destination the signs of where you can and can’t go aren’t always labeled well. I remember feeling unsure if I could enter some buildings or not, but most places are accessible to the public. If they don’t want you in a certain area it will be clearly marked. Otherwise wander around at your leisure and enjoy all the sights. After exiting the admission building you enter a building that is full of snakes, spiders, and other unique reptiles. Shortly after entering this building you will be shown a baby alligator and asked who would like to hold it. They take a picture of your group which you can buy or have printed onto a T-shirt, but it is also a simple way for Colorado Gators to keep track of the number of visitors. 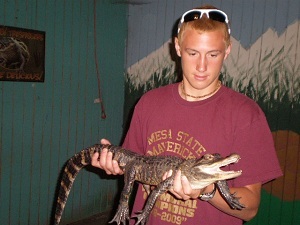 The individual that holds the gator is awarded a certificate of bravery that the alligator “signs” (with his teeth). The staff is also very knowledgeable and friendly so ask all the questions you can think of. Continue through the building and then wander around the farm. Remember, it isn’t always clear where to go so just explore! Be careful to pick up your feet as you cross over the tortoise fences! 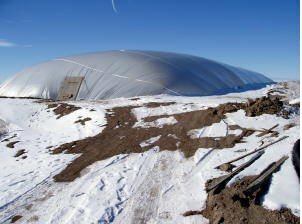 The biodome is a newer feature of the farm. It is the large plastic looking greenhouse thing on the southwest side of the farm. Don’t be afraid to go look around in there. It is part of the tour even though it may look like you’re not allowed to enter. The main idea was that it would help the tilapia grow easier during the winter. What they did not expect was for all kinds of plants to start growing as well. It now grows many vegetables as well as fish. As you continue to wander around you will see alligators of all sizes. 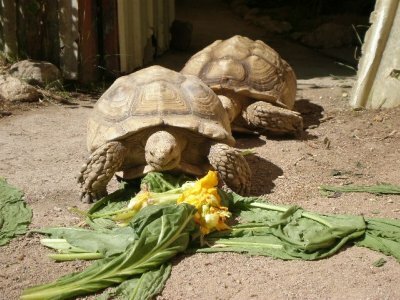 There are also ostriches, emus, and over 125 wild birds that can be seen at Colorado Gators. Don’t forget to look for Morris the Movie Star Alligator. His pen is near the exit by the emus. This area can be over looked as there is so much to see. Morris is the alligator from the following movies and shows: Interview with a Vampire, Doctor Doolittle 2, The Tonight Show with Steve Irwin, Land Rover commercial, and Happy Gilmore. He was moved to Colorado Gators in 2006 as a retirement home. Colorado Gators have placed a female in his pen for company during his retirement. A building that I almost over look every time I visit is where the giant snapping turtle and caiman are. This building is directly to your left as you almost enter the exit building. You will have walked by the emus to get to this building. The snapping turtle can sometimes be hard to see if he is under water so take your time and look for him! Another added feature is fishing along Two Mile Creek. Fishing is catch and release, but you can expect to catch tilapia, catfish, bass, and rainbow trout. If you really love the fish you can take it home to eat at $3.50 per pound. Okay, so it isn’t really alligator wrestling but learning how to handle alligators properly and responsibly. This class allows you to get hands on experience with a 9 foot alligator! You start the day learning on a baby alligator and then work up to a medium sized and finally handle a 9 foot alligator. The cost for the three hour class is $100 dollars. Colorado Gators require that you must sign up and pay at least one week in advance for the class. The classes run on Friday, Saturday, and Sunday weather permitting. Not quite so crazy but still want to handle some of their exotic animals? Colorado Gators offer a reptile handling class which teaches about the biology, behavior, and ecological role of reptiles in nature. This three hour, hands-on class (cost $100) presents a variety of live specimens such as turtles, alligators, snakes, and lizards. You also learn which ones make good pets and which ones don’t! Colorado Gators require that you sign up and pay for the class at least one week in advance as well. 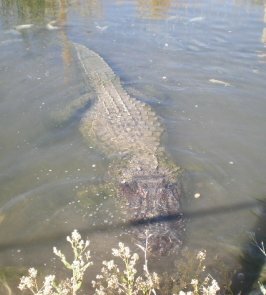 I have created a checklist of areas and animals that you must see while visiting Colorado Gators. Everyone has their own opinions about what exhibit they like best, but I just don’t want you to miss anything! Got A Whopper Of A Gator Story? Share your experience at Colorado Gators. Did you buy the tub of gator feed or hold a snake? What was your favorite part?